His father was called Mr. Perm Bpraanee, and his Mother, Mrs. Jerm Bpraanee. Luang Por Yaem ordained at age 20 in the year 2479 BE, and dedicated the merits to his mother, who passed away a decade before as he was only ten years old. 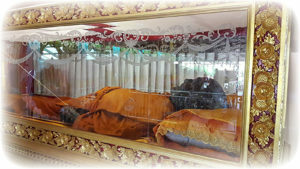 He was ordained at Wat Hlak Sorng. Bangrung Rasadorn. His Upachaya Ordaining Officer was Pr Kroo Kanaa Suntaranuraks, with Jao Atigarn Hluea as his Pra Gammawajajarn Prompting Officer, and Pra Ajarn Chern as his Witness. He received the Ordained Name of ‘Bpiyawanno’. Luang Por never thought he would Ordain for longer than two years, but after his ordination, his practice was very strict and regulated, and his efforts were immensely diligent, to such an extent, that he gained his batchelor’s degree in Dhamma Studies in his first year of Ordination.During his second year of ordination, he became extremely ill, and had to be treated at home with his father to care for him for a month, after which he returned to the temple of Wat Hlak Sorng Bamrungrasadorn (Pronounced ‘Bamrungrat’). As a young monk Luang Por Yaem helped to press and bake clay rooftiles for the buildings of the temple, for indeed the monks of Wat Hlak Sorng Bamrungrat were all well endowed with knowledge of building, and involved in doing the temple constructions themselves. Luang Por used to have to produce at least 530 rooftiles per day on his own. These tiles were used to build an Uposatha, Kuti Songk Residences, and Sala Bprian, and so it can be said that Luang Por Yaem was responsible for the making of every rooftile of all those edifices within the temple by his own hand. Luang Por Yaem was also a diligent student and practitioner of Natural Traditional Healing and Herbal Medicine, and would make potions and tonics to heal any of his devotees who fell ill. In those days it was not easy for country folk to travel to find a doctor or a hospital, and so they would usually go to their local temple for healing, and this is why Thai Buddhism has so many Wicha for Herbal Medicines and Magical Potions. Luang Por Yaem saw the importance of knowing Herbal Medicine and Healing treatments for this very reason, and provided help to the local folk with his healing treatments, from his second year of ordination. The local Folk rapidly developed deep faith in Luang Por Yaem, as his healing treatments began to work and many devotees were healed. Devotees began to flock to the temple to ask not only for healing, but also began to ask for holy water blessings, and perform karma Improvement Blessings. 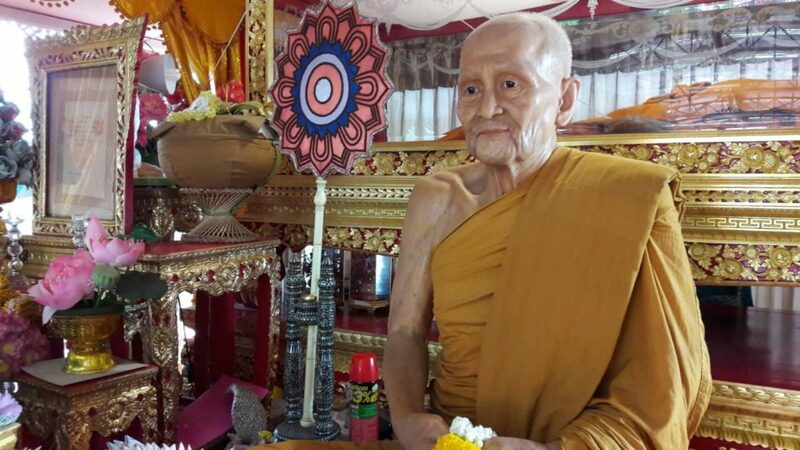 As devotees began to experience the effects of his blessings, his fame began to increase, even in his second year of ordination, whilst still at Wat Hlak Sorng Banmrungrat. It became common assumption that Bhikkhu Yaem was already a Gaeji Ajarn (Master Adept Monk), for the evident effects of his Blessings, which showed his true power. It was at this point that Luang Por Yaem realised he could never get out of this trajectory, and that ever more devotees would begin to come, and so he sought out ever more knowledge in the various Wicha, to help devotees in all areas of life, depending on the needs of the devotee, be it protective magic, mercy charm, fortune bringing, or healing. 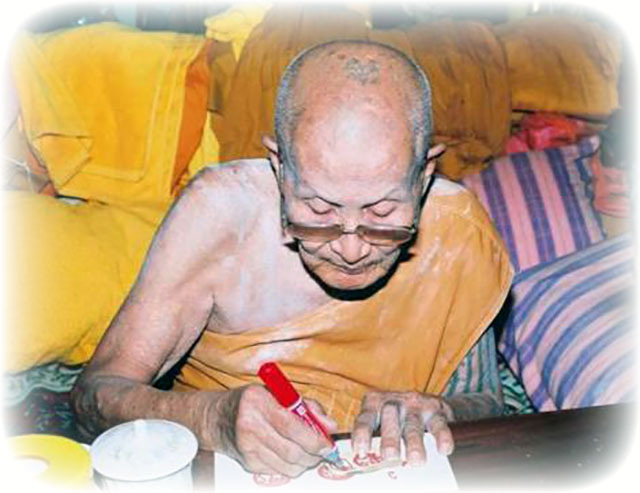 He received the full formula of sorcery spells of the grimoires of Luang Por Say, of Wat Tung Sorng Hong, who passed on all of his knowldge and techniques to Luang Por Yaem personally. Luang Por Yaem’s Mastery of Wicha advanced rtapidly and constantly, and his devotees increased in numbers, until after 10 years of ordination, he was asked by his Uncle to go to be a witness to his nephew’s ordination at Wat Ta-Khian. After Luang Por Yaem witnessed the ordination of his nephew, his Uncle asked Luang Por Yaem to stay with the newly ordained relative at Wat Ta-Khian for a year. So Luang Por Yaem agreed to watch over his newly ordained Nephew for his first year, and moved to stay at Wat Ta-Khian. Luang Por Yaem decided this would be best, as at the time, there was only one other fully fledged Bhikkhu at the temple, the Abbot Luang Por Daeng, along with Luang Por Yaem and his newly ordained Nephew. 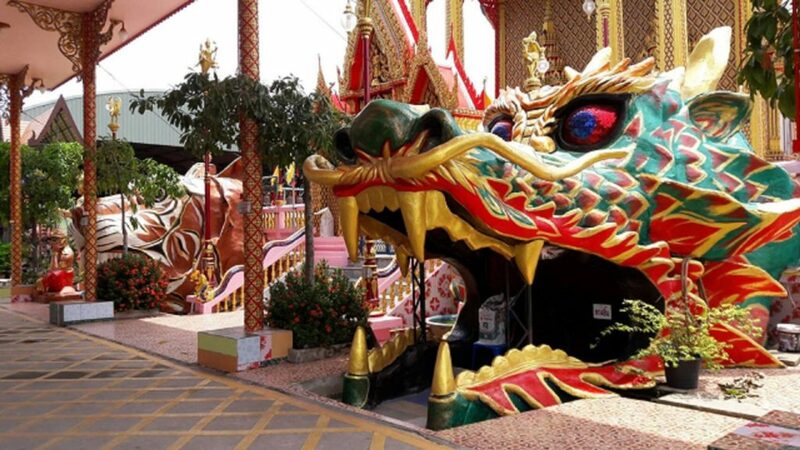 Dragon and Tiger Mouth gates to twin shrines either side of the Uposatha Shrineroom at Wat Takian built by Luang Por Yaem. But after only seven days, Luang Por Daeng passed away, and the Sangha Comittee of the Locality asked Luang Por Yaem to watch over the temple until they had decided on who was to be the new Abbot. 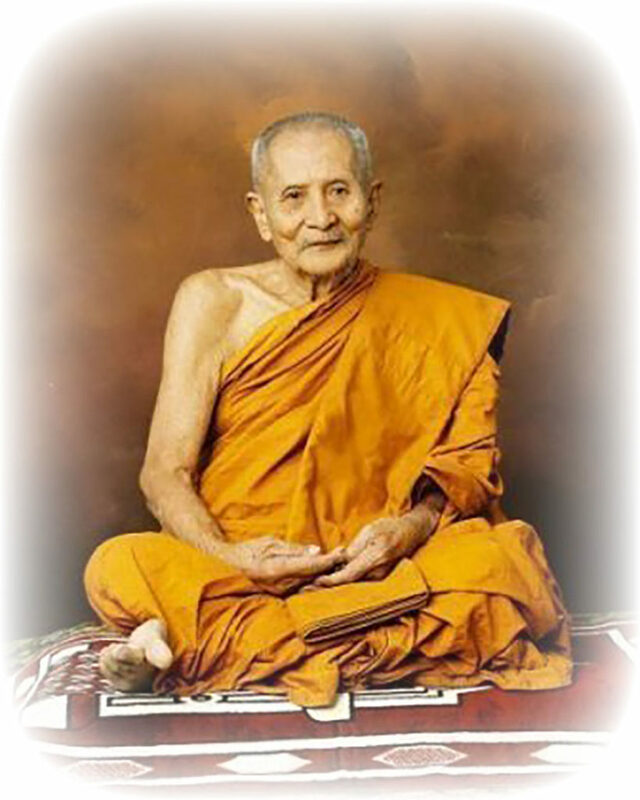 Shortly after, he was elected by the same comittee, to become the official Abbot of Wat Ta-Khian. Luang Por Yaem remained as Abbot of Wat Ta-Khian for over 50 years, and raised the temple from a delapidated small temple, into the large and highly visited religious pilgramage place it is today. His constant and relentless efforts to build and develop the temple complex was exemplary, effective and fast paced. 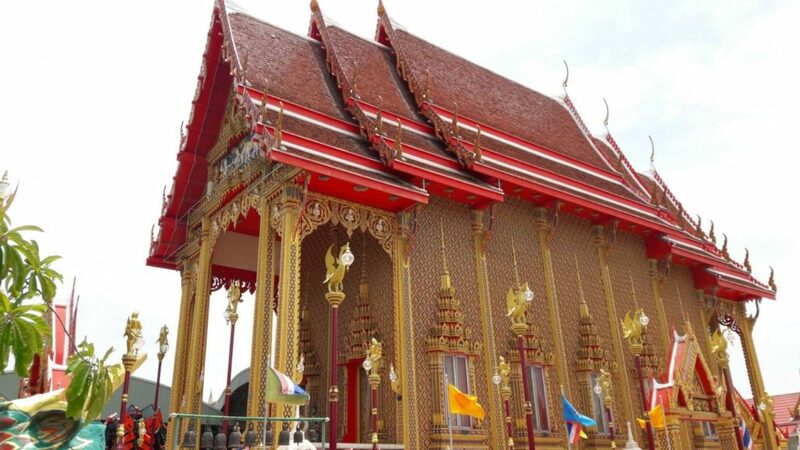 The temple is also now a very popular tourist attraction with Thai Devotees from around the country, and Buddhist around South East Asia, who seek to pay reverence to and beseech blessings from the relics of Luang Por Yaem, who passed away peacefully in 2557 BE. 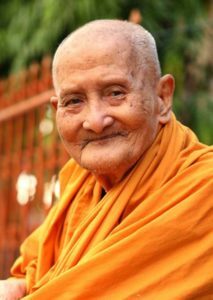 Luang Por Yaem was the abbot of Wat Ta-Khian in Nontaburi for over 50 years, until his passing away on 4th of May 2557 BE, at age 98. His passing closed the ‘Dtamnan’ (legend) of his famous Wicha Takrut Kor Hmaa ‘dogs neck’ Kong Grapan protection spell, and the Wicha Suea Pern Dtaek Gunstopper Tiger Wicha, of this Great Master, whose ability with these Wicha was legendary. Despite the fact of his passing being seemingly recent, his amulets have disappeared from the scene extremely rapidly since the Master has left us, and were also fast to deplete with each edition during Luang Por Yaem’s Lifetime. The popularity of his amulets with his Devotees, for the power of Maha Ud, Klaew Klaad and Metta was, and remains to this day, immense. Luang Por Yaem was a Looksit (apprentice) to the lineage magic of the ‘Lum Mae Nam Ta Jeen’ group of sorcery Masters, who were a group of High Adepts who had gathered their forces to form an alliance and share their Wicha to form a Dtamra. Because of this, Luang Por Yaem received access to a full Dtamra of Grimoires of the Masters of this Lineage, and became Adept at a vast number of different kinds of spells, amulet making methods, and empowerment secrets. To name just some of the many rare and ancient powerful Wicha he possessed, were the Yant Maha Bao, Wicha Maha Ud Pern Dtaek Gunbreaker spell, the Wicha Takrut Kor Hmaa dog neck spell for Kong Grapan Chadtri, Tiger Amulets, such as the world famous Suea Phaen Pern Dtaek leaping tiger brazen metal ‘Loi Ongk’ statuette, and Takrut Hnang Suea, and his ‘Rian Run Raek’ first edition Monk Coin of 2513 BE. 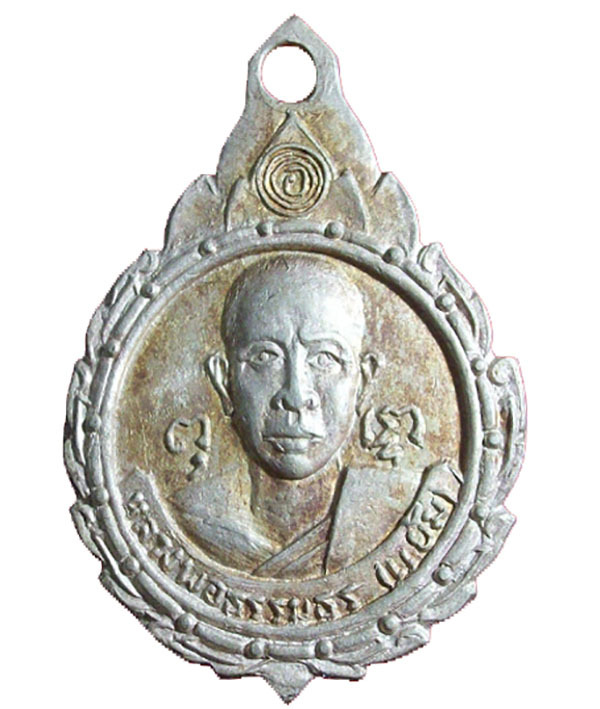 One of the inimitable aspects of the amulets of Luang Por Yaem, is that he would always include the empowerment of the Wicha Yant Maha Bao Maha Ud in all of his amulets, be they Takrut Tone, takrut Tong Daeng, Ngern, Takua, or other inscribed amulets such as Tiger Skin and carved effigies, and some of his Monk Coins, famed for Metta Klaew Klaad and Maha Ud. The Yant Maha Bao Maha Ud is seen on the Rian Run Raek 1st edition monk coin Luang Por Yaem’s first edition Monk Coin was made in Albaca in the year 2513 BE, with 3000 coins made. The coin is hence extremely rare and highly valued. The world famous Suea Pern Dtaek leaping tiger Loi Ongk Statuette amulets were made for the first edition in the year 2540 BE, to raise funds to continue the building of the temple. 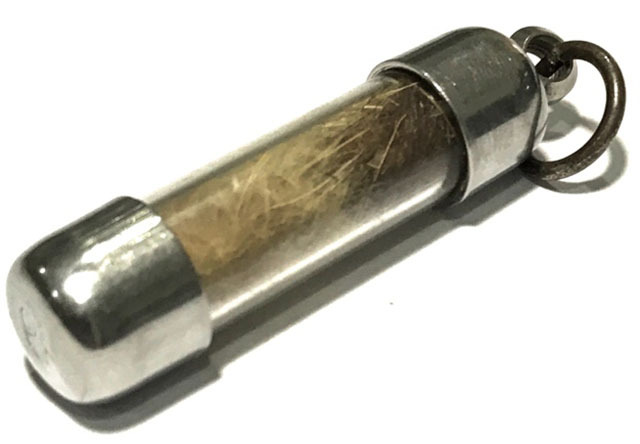 Because of the rumours of Luang Por’s Kong Grapan Klaew Klaad and Maha Ud Pern Dtaek Gunstopper/Gun Breaker powers, some devotees took one of the amulets and tested a gun out on it by shooting at it. The first shot did not fire, so they tried a second shot. The second shot also did not fire, and so they tried once more. 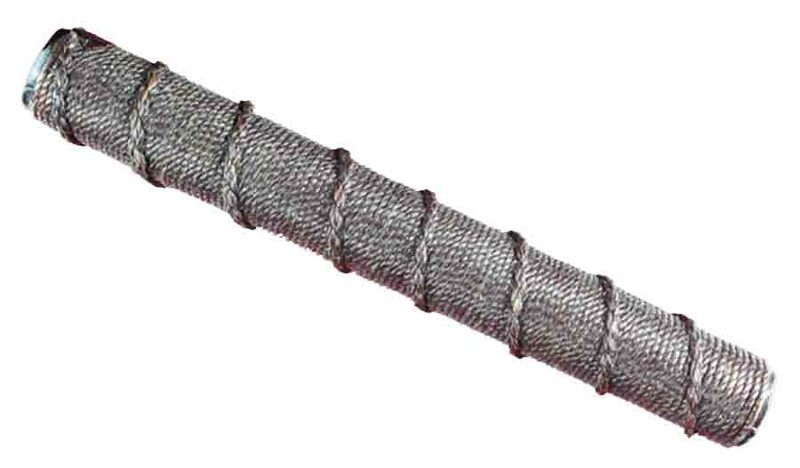 The third time, the gun broke apart, wounding the hand of the person firing it (as if to punish him for insolence). The person was scarred for life. Luang Por released various editions of leaping tigers, between 2540 and 2556 BE, all of which are very difficult to encounter. Another reason for the popularity of Luang Por Yaem’s Suea Pern Dtaek amulets, is the Buddha Abhiseka empowerment and blessing ceremonies always were attended by many great Master Monks. The amulets themself were organised comissioned and designed for Luang Por Yaem through the efforts of Luang Pi Sang-Op (all editions), which is a Meritorious Effort that requires recognition, as a devoted assistant and apprentice to Luang Por Yaem. 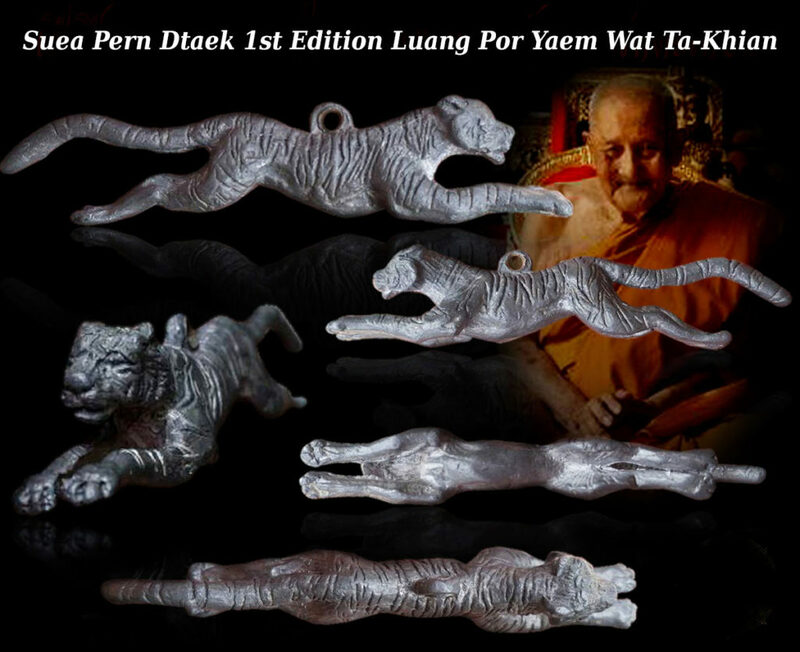 First three editions of Suea Pern Dtaek Leaping Tiger Amulets of Luang Por Yaem. 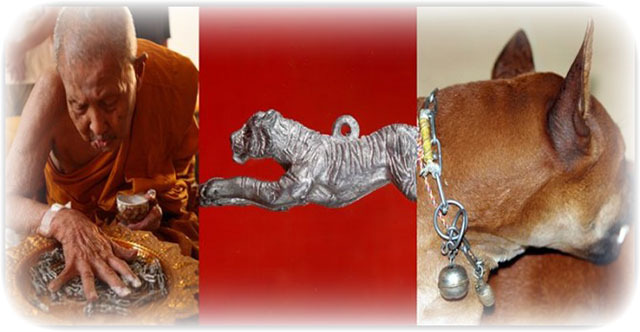 The Suea Phaen Pern Dtaek leaping tiger and other tiger amulets of Luang Phu Yaem are highly sought after amulets, which are extremely difficult to encounter, especially his hand made individual custom amulets and talismans such as the Takrut Kor Hmaa and Tiger Fur Takrut, and of course, rarest of all, his first edition Albaca coin. Luang Por Yaem’s Takrut Kor Hmaa became very famous due to a very unusual story, which also reveals the great compassion of Luang Por Yaem, towards all living sentient beings; Luang Por Yaem used to keep many dogs at the temple, and feed them, some of which were a bit aggressive (protective of the temple and of Luang Por), and would receive blows from stone throwing and even be attacked with blades and shot at with guns by some of the local villagers who did not like dogs, and many dogs would often have large wounds, and suffer. 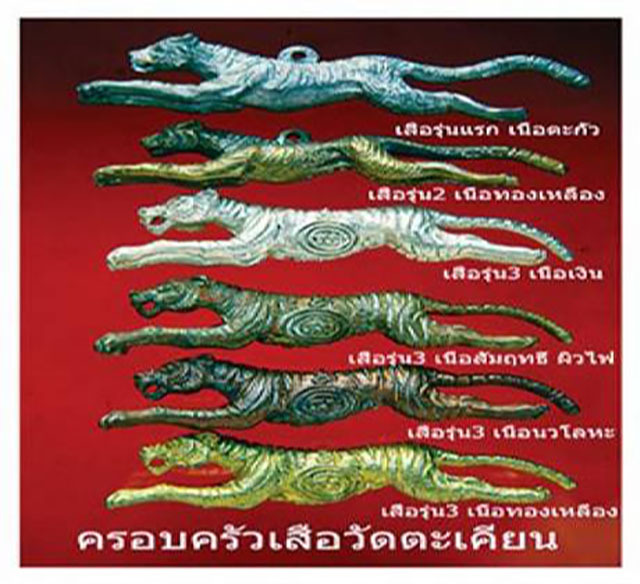 So Luang Por Yaem made a special Takrut using the Wicha Yant Maha Bao Maha Ud, and hung them around the necks of the dogs, to protect them. One day, a villager decided to shoot one of the temple dogs, but when he shot the gun, it exploded in his hand. Upon seeing the dog unharmed and noticing the Takrut around the dog’s neck, the villagers who witnessed the event became excited, and the rumour spread. Many villagers (those with less honesty and good heartedness), actually coaxed the dogs to approach using food and removed (stole) the Takrut for their own use. Others with more precepts of goodness went to the temple to beseech Luang Por Yaem for a Takrut. Luang Por Yaem saw the needs of the people, and began to make Takrut Yant Maha Bao Maha Ud in two versions, one for dogs, and one with a different formula for humans. 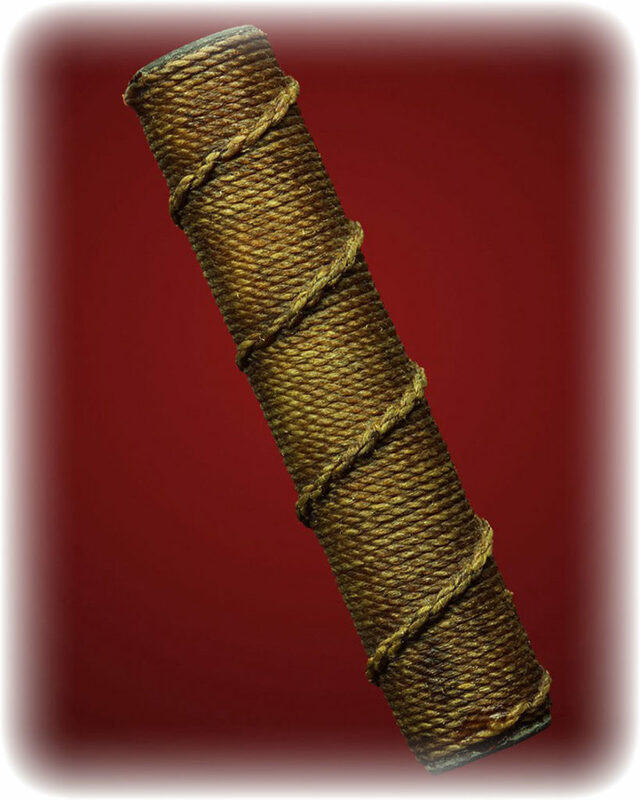 However, after the legendary power of the Takrut becoming even more nationally famous after devotees had many miraculous life saving events occur, with many cases of guns not firing, or exploding, the Takrut Kor Hmaa became the target of forgers, who made a very exact looking copy of the Takrut. This was found out as a devotee took a Takrut to the temple for Luang Por to rebless, and Luang Por Yaem held it, and said immediately ‘this is not my Takrut, it has no power’. In early days, Luang Por Yaem would cut each piece of hide for Tiger takrut one by one in different sizes, and only make small numbers. But as he became old, Luang Por developed a kind of tuberculosis of the lungs, and became concenred that the fur from cutting small pieces one by one, would be breathed in and damage his lungs, so he changed method for later era editions, to that of inscribing square channels on the whole hide, and then cutting them up in one batch. he would then inscribe them as usual, in black, red or blue permanent ink.